The domesticated rat is one of the most common pet animals. Fancy rats are smart, loyal and easily trained. They also care for themselves which makes them very affordable compared to other small pets like hamsters or guinea pigs. There are many fancy rat varieties which differ in coloring, coat, marking and body type, including even hairless rats. World Rat Day was created in 2002 by the Ratlist users. The Ratlist is the oldest mailing list on the World Wide Web dedicated to pet rats. It was founded in 1995 and was originally hosted at the University of Washington. World Rat Day is celebrated on April 4 to commemorate the anniversary of the first Ratlist digest that was released on April 4, 1995. One of the main goals of World Rat Day is to improve the reputation of fancy rats. 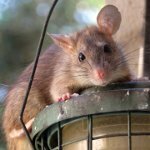 Many people still associate rats with dirt, aggression and disease, although this only applies to wild rats. Domesticated rats are different from their wild relatives, they are friendly and don't pose a health risk, and World Rat Day was created to make people aware of this.